We spent last weekend watching the progress of Tropical Storm Gordon. The projected track took it far enough to our west for it to be of just minor concern. When the marina staff went home for the long Labor Day weekend without even mentioning it, we thought we were home free. They issue a mandatory evacuation of the marina if tropical storm force winds are expected, and since no one seemed concerned, neither were we. 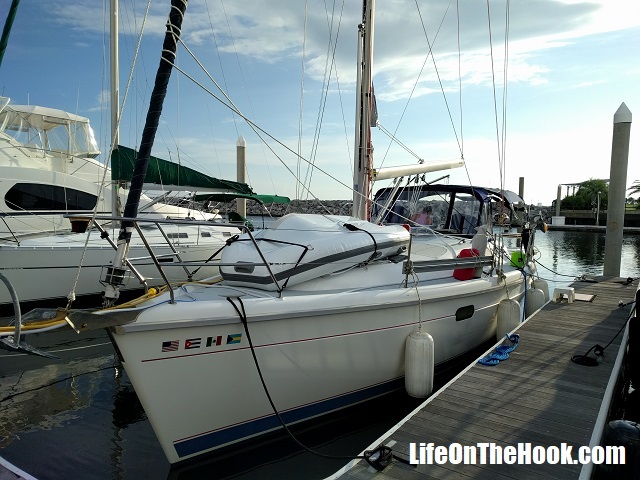 Naturally we did the normal storm prep for gusty winds, like taking all the loose deck gear down below, strapping down the dinghy and rigging some extra lines and fenders. But we didn’t strip the sails or any of our canvas, like our dodger and bimini. We told dockmates who’d never been through a tropical storm not to worry as it just wasn’t going to be that bad. The Tuesday that Gordon paid us a visit started out about like we expected. By mid-afternoon things had turned quite blustery, and we were telling friends that this was probably as bad as it was going to get. 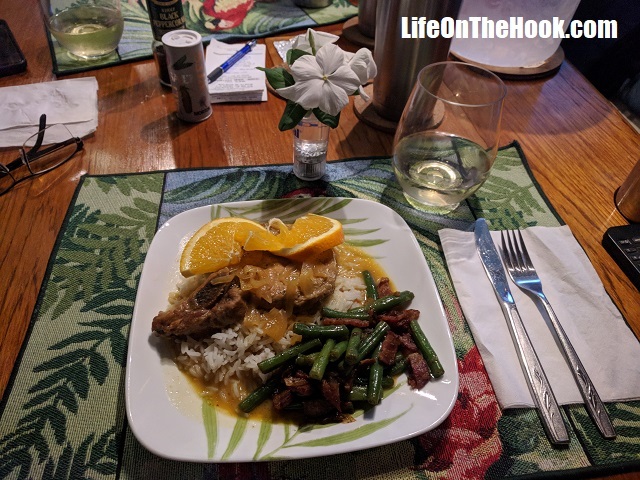 In early evening, the boat was still calm enough that Rhonda was able to whip up a sumptuous and hearty meal. But Gordon had a few tricks up his sleeve. As darkness fell, the storm intensified to almost hurricane strength and veered more to the north, bringing it much closer than expected. By midnight things were pretty intense, with howling winds gusting to 55 mph pushing Eagle Too hard against the pier and creating a 20 to 30 degree heel. I don’t know why storms always come ashore in the middle of the night. It sure seems though that every time we get hit by tropical weather, the worst occurs in the early AM, and Gordon was no exception. At one point, as the winds peaked and rain poured down and tornado alerts began alarming on our phones, we started gathering up some essentials in a ditch bag in case we needed to leave the boat to seek shelter in the marina laundry room. But just when it started feeling like leaving made more sense than staying, things finally started easing up. By 1AM we were able to walk the dock with a flashlight to check our lines and look in on our neighbors who were also riding out the storm onboard their boat. By 2AM we were able to climb into bed for some much needed sleep. By later that morning, it was back to being just another blustery day. We never lost power, and fortunately there was very little lightning, for which we were grateful. We had surprisingly few rain leaks, as the recent work I’ve been doing replacing most of our old, leaky ports paid off. I suppose if we had known exactly how strong Gordon would become, we would have probably buttoned up the boat and headed inland to stay with family. 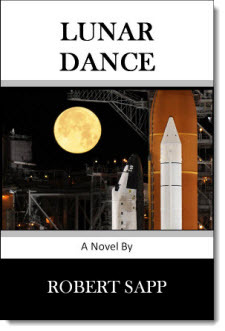 But as we often say, if the experience was frightening but nothing got broken and no one got hurt, then it just means that in the end, we had an adventure resulting in a good story to tell. And adventure is the purpose of a Life On The Hook™, afterall. One last thought. 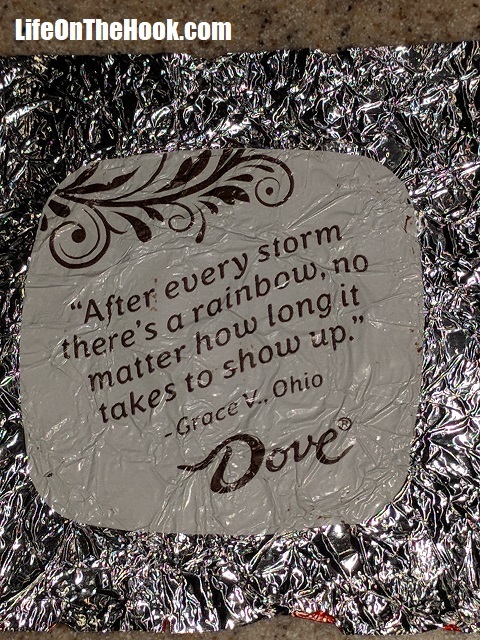 The night before Gordon hit, this was the wrapper from my nightly Dove chocolate (a tradition here on Eagle Too). 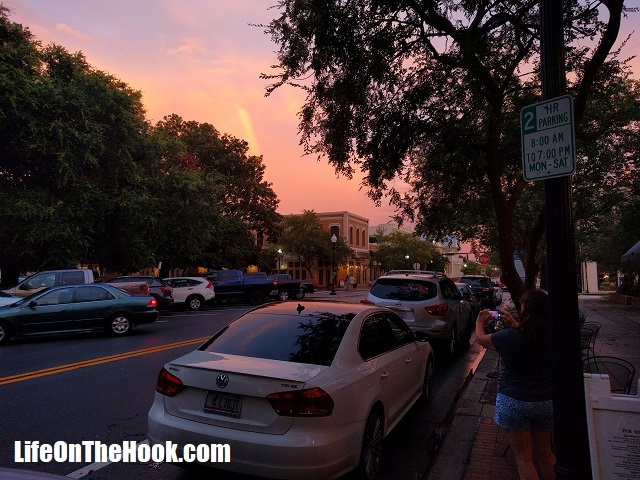 We were having a stress relieving day-after dinner with Beth and Stephan from S/V Cattywampus to celebrate our surviving Tropical Storm Gordon when this rainbow appeared, arcing high over downtown. We’re hoping it’s a sign that with Gordon behind us, we can check that box for the year and not have to worry about storms again until next season! This entry was posted in What? and tagged Kowabunga!, Riding out tropical weather on a boat, Tropical Storm Gordon on September 8, 2018 by Robert.